The telescope is an instrument that gathers light or some other form of electromagnetic radiation (from radio waves to gamma rays) emitted by distant sources. The most common type is the optical telescope, which uses a collection of lenses or mirrors to magnify the visible light emitted by a distant object. There are two basic types of optical telescopes—the refractor and the reflector. The one characteristic all telescopes have in common is the ability to make distant objects appear to be closer. The first optical telescope was constructed in 1608 by Dutch spectacle-maker Hans Lippershey (1570–1619). He used his telescope to view distant objects on the ground, not distant objects in space. The following year, Italian physicist and astronomer Galileo Galilei (1564–1642) built the first astronomical telescope. With this telescope and several following versions, Galileo made the first telescopic observations of the sky and discovered lunar mountains, four of Jupiter's moons, sunspots, and the starry nature of our Milky Way galaxy. Chromatic aberration: Blurred coloring of the edge of an image when white light passes through a lens, caused by the bending of the different wavelengths of the light at different angles. Interferometry: In astronomy, the precise combining of light or radio waves collected by two or more instruments from one single celestial object. Radio wave: Longest form of electromagnetic radiation, measuring up to 6 miles (9.6 kilometers) from peak to peak. Reflector telescope: Telescope that directs light from an opening at one end to a concave mirror at the far end, which reflects the light back to a smaller mirror that directs it to an eyepiece on the side of the tube. Refractor telescope: Telescope that directs light through a glass lens, which bends the light waves and brings them to a focus at an eyepiece that acts as a magnifying glass. X ray: Electromagnetic radiation of a wavelength shorter than ultraviolet radiation but longer than gamma rays that can penetrate solids and produce an electrical charge in gases. In a refractor telescope, light waves from a distant object enter the top of the telescope through a lens called an objective lens. This lens is convex—thicker at the middle than the edges. As light waves pass through it, they are bent (refracted) so that they converge (come together) at a single point, known as the focus, behind the objective lens. The distance between the objective lens and the focus is called the focal length. A second lens, the eyepiece, at the focus then magnifies the image for viewing. This is the type of telescope Galileo developed and used. As refractor telescopes came into wider use, observers realized the instruments had a slight imperfection. Since, like a prism, a lens bends the different wavelengths (colors) that make up light through different angles, refractor telescopes produced a false color around any bright object. This defect is called chromatic aberration. Early astronomers tried to correct this problem by increasing the focal length, but the new instruments were very clumsy to use. A solution to this problem came in 1729 when English scientist Chester Moore Hall (1703–1771) devised the achromatic lens: two lenses, made of different kinds of glass and shape, set close together. As light passes through the lenses, the false color brought about by the first lens is canceled out by the second lens. Hall went on to create the achromatic telescope in 1733. The lens itself was further developed by English optician John Dollard in 1758. His lens combined two or more lenses with varying chemical compositions to minimize the effects of aberration. In a reflector telescope, light waves from a distant object enter the open top end and travel down the tube until they hit a mirror at the bottom. This mirror is concave—thicker at the edges than in the middle. Because of this primary mirror's shape, the light waves are reflected back up the tube to a focus, where a small, flat secondary mirror reflects the image to an eyepiece on the side of the telescope. English physicist and mathematician Isaac Newton (1642–1727) developed the reflector telescope in 1668. English astronomer William Herschel (1738–1822) used an updated version when he discovered Uranus in 1781. Even today, reflectors are perhaps the most prominent type of telescope. They are relatively inexpensive to build and maintain, produce little false color, and maintain a high resolution. The mirrors used in larger reflectors, however, often cause distortion due to the weight on the instrument. Newer reflectors incorporate mirrors of varying shapes (hexagonal glass segments, for example) and of lighter, more durable materials (such as Pyrex™). Earth's atmosphere provides an effective filter for many types of cosmic radiation. This fact is crucial for the survival of humans and other life-forms. However, since the atmosphere only allows visible light and radio waves to pass through it, celestial objects that emit other types of electromagnetic radiation cannot be viewed through telescopes on the ground. Many observatories have been constructed at high altitudes where the atmosphere is thinner—and where the glare of urban artificial light interferes less with viewing—but this improves the situation only slightly. ultraviolet radiation. They discovered hundreds of previously unknown entities, including one likely black hole. While many other space telescopes have been placed in orbit, the most well known is the Hubble Space Telescope (HST). Launched in April 1990 aboard the space shuttle Discovery, the HST has an 8 foot (2.4 meter) primary mirror and five major instruments for examining various characteristics of distant celestial bodies. Shortly after the HST began orbiting Earth, scientists learned that the curve in its primary mirror was off by just a fraction of a hair's width. This flaw caused light to reflect away from the center of the mirror. As a result, the HST produced blurry pictures. 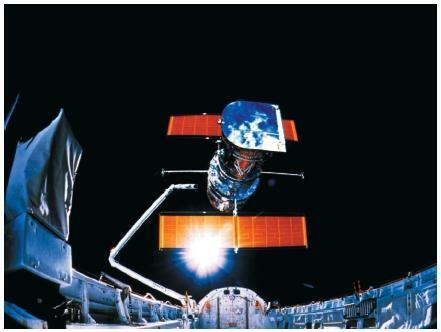 In 1993, astronauts aboard the space shuttle Endeavor caught up with the HST and installed a group of three coin-sized mirrors around the primary mirror, which brought the light into proper focus. In 1997, another space shuttle crew conducted general repairs to the HST. Then in November 1999, the HST stopped working after its gyroscopes broke down. Without the gyroscopes, the telescope could not hold steady while focusing on stars, galaxies, and other cosmic targets. A month later, during an eight-day mission, astronauts aboard the space shuttle Discovery installed almost $70 million worth of new equipment on the HST, including a computer 20 times faster than the telescope's old one; new gyroscopes; batteries with voltage regulators to prevent overheating; a new guidance unit, data recorder, and radio transmitter; and steel sunshades to protect the telescope from solar damage. Despite the need for repairs, the HST has proven to be the finest of all telescopes ever produced. The thousands of images it has captured—a comet hitting Jupiter, a nursery where stars are born, stars that belong to no galaxy, galaxies that house quasars, galaxies violently colliding—have amazed astronomers. Technological advances in the 1990s began to return astronomy to the ground. New observatories have sprung up on every continent, including Antarctica, housing telescopes that are able to capture celestial images almost as clearly as the HST. These new ground-based telescopes are far more advanced than previous ones. The cost of producing their light-gathering mirrors has been reduced, so the mirrors and the telescopes can be built even larger. Advances in photographic devices allow these telescopes to capture images in minutes instead of hours or entire nights. The twin domes at the Keck Observatory complex on Mauna Kea in Hawaii house telescopes with mirrors roughly 32 feet (9.8 meters) in diameter. The Hobby-Eberly Telescope at the University of Texas McDonald Observatory near Fort Davis, Texas, was completed on December 12, 1996. Its mirror, made up of 91 hexagonal segments, measures 36 feet (11 meters) in diameter. trough for trough. 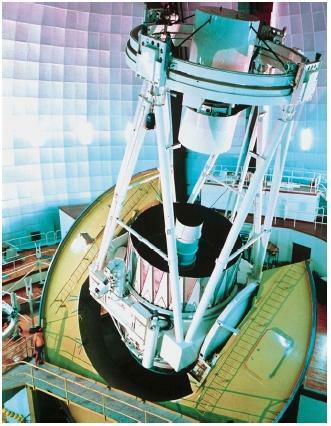 After distortion is removed through mathematical analysis, the resulting image is equal in sharpness to what a single telescope of enormous size can produce. Sometime early in the twenty-first century, the world's largest telescope will be completed. On the summit of Cerro Paranal, an 8, 645-foot (2,635-meter) mountain in the Atacama Desert in northern Chile (an area considered to be the driest on Earth), stands the Paranal Observatory. The observatory houses the Very Large Telescope, which will consist of four telescopes, each containing a mirror almost 27 feet (8.2 meters) in diameter. In the language of the Mapuche, indigenous people who live in the area, the four unit telescopes are known as Antu ("Sun"), Kueyen ("Moon"), Melipal ("Southern Cross"), and Yepun ("Venus"). The four units were each operational as of the beginning of 2001, but had yet to be combined as an interferometer. Through interferometry (the precise combining of light or radio waves collected by two or more instruments from one single celestial object), the teamed instruments will have a light-gathering capacity greater than a single telescope with a mirror more than 52 feet (16 meters) in diameter. When light is concentrated through a convex lens is the wavelength of UV light altered?